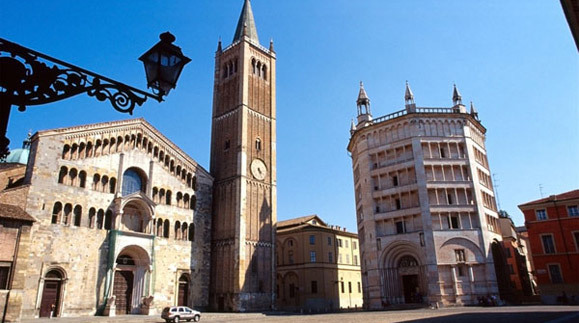 Parma is one of the most fascinating art-cities of northern Italy. In its villages, including its streets, its squares and also on the "Lungoparma" we discover a special grace and kindness now often forgotten elsewhere. The old town retains its elegant examples of civil and religious medieval architecture: the Romanesque Cathedral (Duomo), the Abbey Church of San Giovanni Evangelista with frescoes by Correggio and the pink marble baptistery, by Benedetto Antelami are visited each year by thousands of Italians and foreigners tourists. Very near Piazza Duomo you can visit "la camera di San Paolo" and the Teatro Regio (the stage of the Festival "Verdi", the most important Italian opera- music festival). The palace of "Pilotta" is the cultural landmark of the city: inside are located the National Archaeological Museum, the National Gallery, the Palatine Library and the famous Teatro Farnese, an ancient court environment of the Dukes of Parma entirely made of wood. Near the city there are many paths dedicated to taste and art. Parma and its Food Valley is known worldwide for their traditional products: Parmigiano Reggiano, Parma ham and other cured meats traditional attractions are irresistible to any traveler Gourmet. Also try the route of the Castles of the Duchy of Parma and Piacenza, where you can discover noble castles and medieval villages.